본 발명은 CDMA 2000 Nx-EV-DO 호환 시스템에서 MIMO 지원을 위한 전용 파일럿 할당과 MIMO 전용 인터레이스 슬롯을 설정하기 위한 장치 및 방법에 관한 것으로서, 본 발명에 따른 고속 패킷 데이터(High Rate Packet Data : HRPD) 시스템의 순방향 링크에서 패킷 데이터를 전송하는 송신 방법은 현재 인터레이스가 수신기에서 채널 추정을 위한 다중 입력 다중 출력(Multiple Input Multiple Output : MIMO) 신호가 삽입되는 특정 인터레이스인지 확인하는 과정; The present invention is CDMA 2000 Nx-EV-DO on a compatible system relates to an apparatus and method for setting up a dedicated pilot allocation and MIMO-only interlaced slots for MIMO support, a high-speed packet data in accordance with the present invention (High Rate Packet Data: HRPD ) transmission method of transmitting packet data on the forward link of the system is now interlaced a multiple-input multiple-output (multiple input multiple output for channel estimation in the receiver: the process to determine whether a particular interlace that MIMO) signal insertion; 및 상기 현재 인터레이스가 상기 특정 인터레이스에 해당되는 경우 정해진 전송 방식에 따라 상기 특정 인터레이스에 상기 MIMO 신호를 삽입하여 전송하는 과정을 포함한다. And a step of transmitting by inserting the MIMO signal to the particular interlace according to a predetermined transmission method if the currently interlaced corresponding to the particular interlace. 따라서 본 발명에 의하면, 특정 MIMO 인터레이스에 다중 안테나를 위한 MIMO 전용 파일럿/파일럿 톤을 전송하여 예컨대, EV-DO, MIMO-EV-DO, OFDM 또는 MIMO-OFDM 사용자가 공존하는 시스템에서 MIMO를 효과적으로 사용할 수 있다. Therefore, in accordance with the present invention, by sending a MIMO dedicated pilot / pilot tone for the multiple antennas to a particular MIMO interlace e.g., EV-DO, MIMO-EV-DO, OFDM or MIMO-OFDM user coexistence of MIMO on the system used effectively to can. 본 발명은 고속 패킷 데이터(High Rate Packet Data : HRPD) 시스템에서 데이터 송수신 장치 및 방법에 대한 것으로서, 특히 상기 HRPD 시스템에서 EV-DO(Evolution Data Only) 전송 방식은 물론 직교 주파수 분할 다중(Orthogonal Frequency Division Multiplexing : OFDM) 전송 방식과 다중 입력 다중 출력(Multiple Input Multiple Output : MIMO) 기술을 지원하는 송수신 장치 및 방법에 대한 것이다. The present invention is an HRPD (High Rate Packet Data: HRPD) from the system as to the data transmitting and receiving apparatus and method, and particularly EV-DO (Evolution Data Only) transmission method in the HRPD system, as well as an Orthogonal Frequency Division Multiplexing (Orthogonal Frequency Division Multiplexing: relates to a transmission and reception apparatus and method for supporting MIMO) technology: OFDM) transmission scheme and a multiple-input multiple-output (multiple input multiple output. 통신 기술의 급격한 발전에 따라 이동통신 시스템은 일반적인 음성통화 서비스는 물론 이동 단말로 이메일이나 정지 영상은 물론 동영상과 같은 대용량의 디지털 데이터 전송이 가능한 고속 데이터 서비스를 제공하는 단계에 이르고 있다. E-mail to the mobile communication system is a typical mobile terminal, as well as voice communication service in accordance with the rapid development of communication technology and still images as well has reached the step of providing a large amount of digital data is high-speed data services, such as video. 현재 고속 데이터 서비스를 제공하는 이동통신 시스템의 대표적인 예로는 EV-DO, OFDM 시스템 등이 있다. A typical example of a mobile communication system for providing a current high-speed data services and the like EV-DO, OFDM system. 상기 EV-DO 시스템은 대용량의 디지털 데이터 전송을 위해 미국의 퀄검사(Qualcomm)에 의해 제안된 고속 데이터 서비스 표준의 하나로 종래 CDMA 2000 1x를 한 단계 진화시켜 약 2.4Mbps의 순방향 전송 속도를 제공하도록 마련된 것이다. The EV-DO system by a conventional one-step evolving the CDMA 2000 1x for high volume digital data transmission in one of the high-speed data service standards proposed by the US Qualmark test (Qualcomm) adapted to provide a forward data rate of about 2.4Mbps will be. 상기 EV-DO 시스템은 상기 HRPD 시스템이라고도 불리운다. The EV-DO system is also called the HRPD system. 또한 다중 반송파 전송 방식을 적용하는 대표적인 무선 통신 시스템의 하나로 OFDM을 들 수 있다. In addition, there may be mentioned as one of the exemplary OFDM wireless communication system employing a multicarrier transmission method. 상기 OFDM 시스템의 전송 방식은 직렬로 입력되는 심벌(Symbol)열을 병렬로 변환하여 이들 각각을 상호 직교성을 갖는 다수의 부반송파를 통해 변조하여 전송하는 방식으로 1990년대 초반 이후 VLSI(Very Large Scale Integration) 기술의 발전에 따라서 각광 받기 시작하였다. Transmission scheme of the OFDM system, symbols input in series (Symbol) a plurality of sub-carriers the manner in VLSI (Very Large Scale Integration) since the early 1990's and transmitting the modulated through each of which converts the heat in parallel with mutual orthogonality So we started getting popular in the development of the technology. 상기 OFDM 전송 방식은 복수 개의 부반송파(subcarrier)를 이용하여 데이터를 변조시키며, 각각의 부반송파는 상호 직교성(orthogonality)을 유지하여 기존 단일 반송파 전송 방식(single carrier modulation scheme)에 비해서 주파수 선택 적 다중 경로 페이딩 채널(frequency selective multipath fading channel)에 강한 특성을 보이며, 방송 서비스 등 고속 패킷 데이터 서비스에 적합한 전송 방식이다. The OFDM transmission scheme sikimyeo modulate data using a plurality of subcarriers (subcarrier), each sub-carrier is selected frequencies compared to maintain mutual orthogonality (orthogonality) to conventional single-carrier transmission method (single carrier modulation scheme) enemy multipath fading It showed a robustness to channel (frequency selective multipath fading channel), a transmission scheme suitable for high speed packet data service such as broadcasting service. 이하에서는 일반적인 HRPD 시스템의 순방향 링크에서 슬롯 구조와 송신기 구조를 간략히 설명하기로 한다. Hereinafter, in the forward link of the HRPD system to a general overview of a slot structure and a transmitter structure. 상기 HRPD 시스템의 순방향 링크에서는 다중 접속 기술로 TDMA 기법이 사용되고, 다중화 방식으로는 TDM(Time Division Multiplexing)/CDM(Code Division Multiplexing) 기법이 사용되고 있다. In the forward link of the HRPD system, a TDMA scheme is used as a multiple access technique, a multiplexing scheme has been used a TDM (Time Division Multiplexing) / CDM (Code Division Multiplexing) scheme. 도 1은 일반적인 HRPD 시스템에서 순방향 링크의 슬롯(slot) 구조를 도시한 도면이다. 1 is a diagram showing a slot (slot) structure of a forward link in a general HRPD system. 도 1에 도시된 바와 같이 HRPD 시스템에서 한 슬롯은 반 슬롯 구조가 반복된 형태를 갖는다. Even the one slot in the HRPD system, as shown in Figure 1 has a half-slot structure repeats form. 반 슬롯의 중앙에는 N pilot 칩(chip) 길이의 파일럿 신호(Pilot signal)(103, 108)가 삽입되며, 이는 이동 단말의 수신기에서 순방향 링크의 채널 추정에 이용된다. The center of the half slot, and insert the N pilot chips (chip) length of the pilot signal (Pilot signal) (103, 108 ), which is used for channel estimation of the forward link at a receiver of the mobile terminal. 파일럿 신호(103, 108)의 양측에는 역방향 전력제어 정보, 자원 할당 정보 등을 포함하는 N MAC 칩 길이의 매체 접근 제어(Medium Access Control : MAC) 신호(102, 104, 107, 109)가 전송된다. Medium of the N MAC chip length to both sides of the pilot signal (103, 108) including uplink power control information, resource allocation information access control (Medium Access Control: MAC), a signal (102, 104, 107, 109) is transmitted . 그리고 상기 MAC 신호(102, 104, 107, 109)의 양측에는 N Data 칩 길이의 실제 전송 데이터(101, 105, 106, 110)가 전송된다. Further, the MAC signal (102, 104, 107, 109) on both sides, the Data N chip length of the actual data transfer (101, 105, 106, 110) of the transmitted. 이와 같이 HRPD 시스템에서 순방향 링크의 슬롯(slot)은 파일럿, MAC 정보, 데이터 등이 서로 다른 시간에 전송되는 TDM 방식으로 다중화되어 있다. Thus slot (slot) of the forward link in the HRPD system is multiplexed with the pilot, MAC information, TDM manner in which data and the like are transmitted at different times. 도 1의 슬롯 구조에서 MAC 정보와 데이터는 왈시(Walsh) 코드를 이용한 CDM 방식으로 다중화되며, HRPD 시스템의 순방향 링크에서 파일럿 신호, MAC 신호, 데이터의 소블럭 단위의 크기는 예를 들어 N pilot = 96 칩, N MAC = 64 칩, N Data = 400 칩으로 설정되어 있다. FIG MAC information and data of the slot structure of Fig. 1 are multiplexed in CDM scheme using Walsh (Walsh) code, the size of the small block unit of a pilot signal, MAC signal, and data on the forward link of the HRPD system, for example, N pilot = 96 are set to the chip, N MAC = 64 chips, N Data = 400 chips. 도 2는 일반적인 HRPD 시스템에서 송신기의 구조를 도시한 도면이다. Figure 2 is a diagram showing a structure of a transmitter in a general HRPD system. 도 2를 참조하면, 데이터 채널의 패킷 데이터는 상기 패킷 데이터를 채널 부호화하는 채널 부호화기(channel encoder)(201)와, 부호화된 패킷 데이터를 인터리빙(interleaving)하는 채널 인터리버(channel interleaver)(202)와, 인터리빙된 패킷 데이터를 변조하는 변조기(203)를 거친다. 2, the packet data of the data channel is a channel encoder (channel encoder) (201) and, for interleaving (interleaving) the coded packet data, a channel interleaver (channel interleaver) (202) for channel encoding the packet data and , subjected to a modulator 203 for modulating the interleaved packet data. MAC 채널의 데이터는 채널 부호화기(204)를 거친다. Data of the MAC channel is subjected to channel encoder 204. The 파일럿 톤(pilot tone)과, MAC 신호, 데이터는 TDM 다중화기(MUX)(206)를 거친 후, 도 1과 같은 슬롯 구조의 물리 계층(Physical Link)를 이룬다. It forms a pilot-tone (pilot tone) and, MAC signal, and data is TDM multiplexer (MUX) and then subjected to 206, the physical layer (Physical Link) of the slot structure as that of FIG. TDM 다중화기(206)를 거친 데이터는 반송파 변조기(207)를 거쳐 안테나(도시되지 않음)를 통해 사용자들에게 전송된다. Data via the TDM multiplexer 206 is transmitted to the user via an antenna (not shown) through a carrier modulator (207). 도 2에서 참조 번호 208은 HRPD 시스템과의 호환을 위해 채널 부호화기(204), TDM 다중화기(206) 및 반송파 변조기(207)를 포함하는 HRPD 호환 처리기를 나타낸 것이다. Reference numeral 208 in FIG. 2 illustrates an HRPD-compatible processor including channel encoder (204), TDM multiplexer 206 and carrier modulator 207, for compatibility with HRPD system. 그러나 상기한 구성의 HRPD 시스템은 방송 서비스 등 차세대 시스템의 요구사항인 광대역 데이터 전송과 주파수 자원의 효율적인 사용을 충분히 지원하기에는 부족함이 있으며, 이를 지원하기 위해서는 적합한 데이터의 변조 방법 및 다중 안테나를 사용하여 고속의 데이터 전송 및 주파수의 효율적인 이용을 위한 방안이 요구된다. However, a high speed by the HRPD system of the above arrangement is the lack hagieneun enough for efficient use of broadband data transmission and frequency resource information of the next generation of system requirements such as a broadcast service, using a modulation method and multiple antennas at the appropriate data to support this, of the measures for the efficient use of data transmission and frequency it is required. 본 발명은 HRPD 시스템에서 EV-DO 전송 방식은 물론 OFDM 전송 방식과 MIMO 기술을 지원하는 송수신 장치 및 방법을 제공한다. The invention EV-DO transmission scheme in HRPD systems, as well as provide a transmitting and receiving apparatus and method for supporting the OFDM transmission scheme and the MIMO technology. 본 발명은 HRPD 시스템에서 EV-DO 전송 방식은 물론 OFDM 전송 방식을 지원하며, 데이터 심볼의 위치를 고정된 인터레이스로 할당하여 MIMO 기술을 지원하는 송수신 장치 및 방법을 제공한다. The invention EV-DO transmission scheme in HRPD systems, as well as supports the OFDM transmission scheme, and to assign the location of the data symbols at a fixed interlaced provides a transmitting and receiving apparatus and method for supporting MIMO technology. 본 발명에 따른 HRPD 시스템의 순방향 링크에서 패킷 데이터를 전송하는 송신기는 물리 계층 패킷 데이터를 정해진 전송 방식에 따른 송신 신호로 변조하여 무선망으로 송출하는 송신부, 상기 송신 신호가 전송되는 슬롯의 특정 인터레이스에 수신기에서 채널 추정을 위한 MIMO 신호를 삽입하는 MIMO 신호 삽입기, 및 상기 특정 인터레이스에 상기 MIMO 신호를 삽입하도록 상기 MIMO 신호 삽입기의 동작을 제어하는 MIMO 인터레이스 선택기를 포함한다. A transmitter for transmitting the packet data on the forward link of the HRPD system according to the present invention is a specific interlace in the slot to which the transmission section, said transmission signal by modulating a physical layer packet of data to a transmission signal according to the determined transmission mode transmitted to the wireless network transmission and a MIMO signal inserted group of inserting the MIMO signal for channel estimation at a receiver, and the particular interlace including the MIMO interlace selector for controlling an operation of the MIMO signal inserter to insert the MIMO signal. 본 발명에 따른 HRPD 시스템의 순방향 링크에서 패킷 데이터를 전송하는 송신 방법은 현재 인터레이스가 수신기에서 채널 추정을 위한 MIMO 신호가 삽입되는 특정 인터레이스인지 확인하는 과정, 및 상기 현재 인터레이스가 상기 특정 인터레이스에 해당되는 경우 정해진 전송 방식에 따라 상기 특정 인터레이스에 상기 MIMO 신호를 삽입하여 전송하는 과정을 포함한다. A transmission method for transmitting packet data in a forward link of the HRPD system according to the present invention are interlaced are that degree, and the current interlace to determine whether a particular interlace is a MIMO signal for channel estimation at the receiver inserts corresponding to the particular interlace If according to a predetermined transmission method comprises the step of transmission by inserting the MIMO signal to the particular interlace. 또한 본 발명에 따른 HRPD 시스템의 순방향 링크에서 패킷 데이터를 수신하는 수신기는 무선 신호가 전송되는 슬롯의 특정 인터레이스로부터 채널 추정을 위한 MIMO 신호를 추출하는 MIMO 신호 추출기, 및 상기 무선 신호를 정해진 전송 방식에 따라 수신하고, 상기 MIMO 신호를 이용하여 채널을 추정한 후 상기 무선 신호로부터 패킷 데이터를 복조하는 수신부를 포함하며, 상기 특정 인터레이스에 대한 정보는 상기 패킷 데이터를 송신하는 송신기와 상기 수신기간에 서로 약속된 정보와 상기 송신기로부터 상기 수신기로 전송되는 제어 정보 중 적어도 하나를 이용한다. In addition, the present invention a receiver for receiving the packet data on the forward link of the HRPD system according to the MIMO signal extractor for extracting a MIMO signal for the channel estimation from a particular interlace of the slot to which the wireless signal transmission, and the transmission mode determined for the radio signal received, and then estimates a channel using the MIMO signal includes a reception unit for demodulating the packet data from the wireless signal, information about the particular interlace promise each other in the transmitter and the receiver for transmitting the packet data according It utilizes at least one of the control information transmitted from the information and the transmitter to the receiver. 본 발명에 따른 HRPD 시스템의 순방향 링크에서 패킷 데이터를 수신하는 수신 방법은 무선 신호가 전송되는 슬롯의 특정 인터레이스로부터 채널 추정을 위한 MIMO 신호를 추출하는 과정, 상기 무선 신호를 정해진 전송 방식에 따라 수신하고, 상기 MIMO 신호를 이용하여 채널을 추정하는 과정, 및 상기 추정 결과를 이용하여 상기 무선 신호로부터 패킷 데이터를 복조하는 과정을 포함하며, 상기 특정 인터페이스에 대한 정보는 상기 패킷 데이터를 송신하는 송신기와 수신기간에 서로 약속된 정보와 상기 송신기로부터 상기 수신기로 전송되는 제어 정보 중 적어도 하나를 이용한다. A receiving method for receiving packet data on the forward link of the HRPD system according to the present invention receives the process, the radio signal to extract MIMO signals for channel estimation from a particular interlace of the slot to which the wireless signal is transmitted according to a predetermined transmission scheme , process, and by using the estimation result to estimate the channel using the MIMO signal comprises the step of demodulating the packet data from the wireless signal, information of the specific interface is received and a transmitter for transmitting the packet data the information from the transmitter to each other appointment term use at least one of control information to be transmitted to the receiver. 이하 본 발명의 바람직한 실시 예를 첨부한 도면을 참조하여 상세히 설명한다. With reference to the accompanying drawings a preferred embodiment of the present invention will be described in detail. 그리고 본 발명을 설명함에 있어, 관련된 공지 기능 또는 구성에 대한 구체적인 설명이 본 발명의 요지를 불필요하게 흐릴 수 있다고 판단되는 경우 그 상세한 설명을 생략한다. And in the following description of the present invention, a detailed description of known functions and configurations that are determined to unnecessarily obscure the subject matter of the present invention, a detailed description thereof will be omitted. 도 3은 본 발명의 실시 예에 따라 HRPD 시스템의 순방향 링크에서 데이터 전송 구간에 OFDM 심볼을 삽입한 슬롯 구조를 도시한 도면이다. 3 is a diagram illustrating a slot structure inserting an OFDM symbol in a data transmission interval in a forward link of the HRPD system according to an embodiment of the invention. HRPD 시스템에서 순방향 링크와의 호환성을 유지하기 위한 파일럿 신호와 MAC 신호의 위치와 크기는 도 1에서 설명한 일반적인 순방향 링크의 슬롯 구조와 동일하다. Size and position of the pilot signal and the MAC signal to maintain the compatibility with a forward link in the HRPD system is identical to the slot structure of a general forward link described in FIG. 따라서 반 슬롯의 중앙에는 N pilot 칩 길이의 파일럿 신호(303, 308)가 위치하고, 파일럿 신호(303, 308)의 양측에는 N MAC 칩 길이의 MAC 신호(302, 304, 307, 309)가 위치한다. Thus half the center is located a pilot signal (303, 308) of the N pilot chip length of the slot, and a pilot signal (303, 308) on both sides, the MAC signal of N MAC chip length (302, 304, 307, 309) of the position . 따라서 OFDM 전송 방식을 지원하지 않는 일반적인 HRPD 단말도 파일럿 신호(303, 308)를 통해 채널을 추정하고, MAC 신호(302, 304, 307, 309)를 수신할 수 있다. Therefore, general HRPD terminal not supporting the OFDM transmission scheme can also estimate a channel using the pilot signal (303, 308), and receives a MAC signal (302, 304, 307, 309). 슬롯의 남은 영역 즉 데이터 전송 구간에서는 OFDM 심볼(301, 305, 306, 310)을 삽입한다. In the remaining area that is a data transmission interval of the slot and inserts the OFDM symbols (301, 305, 306, 310). 일반적인 HRPD 시스템의 순방향 링크에서 데이터 전송 구간은 N Data = 400 칩으로 설정되어 있었으므로, OFDM 심볼의 크기 또한 N Data = 400 칩이다. Common data transmission interval in a forward link of the HRPD system, because there is set to N Data = 400 chips, the size of the OFDM symbol is also N Data = 400 chips. OFDM 전송 방식에서는 다중 경로를 통해 시간 지연된 수신 신호가 자기 간섭을 일으키는 것을 방지하기 위해 싸이클릭 프리픽스(Cyclic Prefix : CP)를 OFDM 심볼의 앞 부분에 덧붙여 전송한다. OFDM transmission method, the cyclic prefix in order to prevent the time-delayed receive signals through multiple paths that cause magnetic interference: transmit the addition (Cyclic Prefix CP) at the beginning of the OFDM symbol. 즉 하나의 OFDM 심볼은 패킷 데이터 정보를 역방향 고속 퓨리에 변환(Inverse Fast Fourier Transform : IFFT)한 OFDM 데이터(301a)와 CP(301b)로 구성된다. That is, one OFDM symbol is a data packet information reverse fast Fourier transform: is composed of (Inverse Fast Fourier Transform IFFT) the OFDM data (301a) and CP (301b). 상기 CP(301b)의 크기는 N CP 칩으로 OFDM 데이터의 뒷 부분에서 N CP 칩만큼의 신호를 복사하여 OFDM 데이터 앞 부분에 삽입한 것이다. The size of the CP (301b) is inserted in the front of OFDM data by copying the signal of the CP by N chips in the rear of the OFDM data to N CP chip. 따라서 OFDM 데이터의 크기는 (N Data - N CP ) 칩이 된다. Therefore, the size of the OFDM data - is a chip (Data N N CP). 여기서 N CP 는 자기 간섭을 일으키는 시간 지연을 얼마만큼 허용할 것인가에 의해 결정된다. Wherein N is determined by the CP will allow much time delay that causes self interference. 만약 N CP 가 크다면 더 많은 지연된 수신 신호 가 간섭을 일으키지 않고 복조되지만 OFDM 데이터의 크기가 작아지기 때문에 전송할 수 있는 정보량은 줄어든다. If N is greater surfaces CP more delayed received signal is demodulated without causing interference, but the amount of information that can be sent, since the size of the OFDM data decreases is reduced. 반면 N CP 가 작다면 보낼 수 있는 정보량은 커지지만 다중 경로 페이딩이 심한 환경에서 자기 간섭이 발생할 확률이 높아져 수신 품질이 나빠진다. On the other hand, if N CP is the increased amount of information is likely to occur in a severe multipath fading environments grow only magnetic interference that can send receive less quality deteriorates. N Data 개의 톤이 모두 데이터 심볼 전송에 이용될 수는 없다. Data is N tones not all can be used for data symbol transmission. 사용하는 주파수 대역의 가장자리에 있는 일부 톤은 대역외 신호가 간섭으로 영향을 미치는 것을 줄이기 위한 경계 톤(Guard Tone)으로 사용해야 한다. Some tones at the edge of the frequency band used should be used as a guard tone (Guard Tone) to reduce the out-of-band signals to affect the interference. 기존 HRPD 시스템의 순방향 링크에서 사용하는 파일럿 신호(303, 308)는 OFDM 심볼의 채널 추정을 위해서도 사용한다. Pilot signal (303, 308) used in the forward link of the conventional HRPD system is also used for channel estimation of the OFDM symbol. 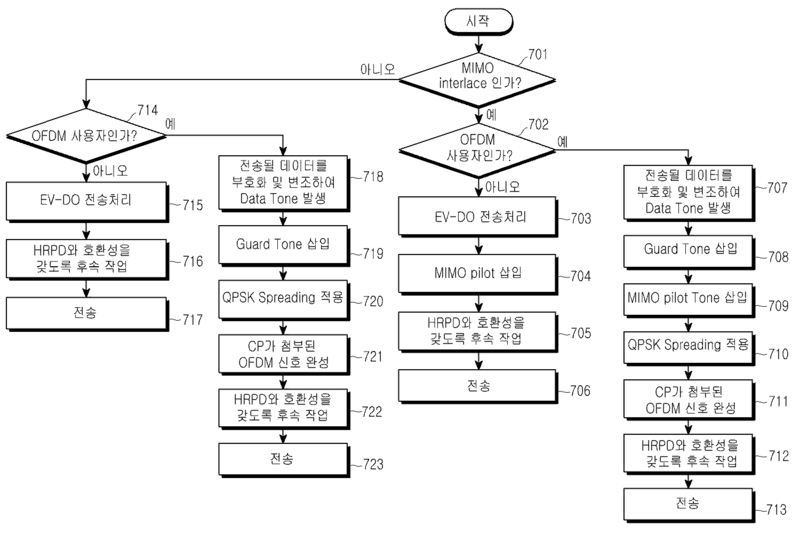 하지만 다중 입력 다중 출력(Multiple Input Multiple Output : MIMO) 사용자들을 위한 다중 안테나의 채널 추정을 위해서는 전용의 파일럿 신호가 추가적으로 필요하다. However, multiple-input multiple-output (Multiple Input Multiple Output: MIMO) is needed in addition to pilot signal of the dedicated channel estimation of the multiple antennas for the user. 이를 위해 톤의 일부에 송수신기가 미리 약속한 신호를 전송하여 채널 추정에 이용할 수 있으며, 본 명세서에서는 이러한 톤을 MIMO 파일럿 톤이라 칭하기로 한다. By sending a signal transceiver is preset to a part of the tone can be used for channel estimation and for this purpose, this specification, and in such a tone will be referred to as a MIMO pilot tone. 도 4는 본 발명의 실시 예에 따른 HRPD 시스템에서 송신기의 구조를 도시한 도면이다. Figure 4 is a diagram showing a structure of a transmitter in an HRPD system according to an embodiment of the invention. 도 4의 송신기는 도시된 바와 같이 패킷 데이터를 채널 부호화하는 채널 부호화기(401)와, 부호화된 패킷 데이터를 인터리빙하는 채널 인터리버(402)와, 인터리빙된 패킷 데이터를 변조하는 변조기(403)와, 대역외 신호가 간섭으로 영향을 미치는 것을 줄이기 위한 경계톤을 삽입하는 경계톤 삽입기(404) 및 MIMO 사용자의 수신 단말에서 다중 안테나의 채널 추정을 위한 MIMO 파일럿 톤을 삽입하는 MIMO 파일럿 톤 삽입기(405)를 포함한다. And Figure 4 transmitter illustrates a packet data channel coding channel encoder 401 and, and for interleaving the coded packet data, a channel interleaver 402, a modulator 403 for modulating the interleaved packet data, as described, the bands group other signal is to insert a guard tone to reduce the influence of interference guard tone inserter 404 and a MIMO MIMO pilot tone inserter for inserting a MIMO pilot tones for channel estimation of the multiple antennas at the user receiving terminal (405 ) a. 또한 상기 송신기는 확산기(406)와, 시간 영역의 신호를 주파수 영역의 신호로 변환하는 IFFT 처리기(407)와, 신호 간섭을 방지하기 위해 OFDM 데이터의 앞 부분에 CP를 삽입하는 CP 삽입기(408)와, HRPD 시스템의 전송 방식과 호환을 위한 HRPD 호환 처리기(415)와, EV-DO 송신기(411)와, HRPD 시스템용 MIMO 파일럿을 삽입하는 MIMO 파일럿 삽입기(310)를 구비한다. In addition, the transmitter includes a spreader 406, and the IFFT processor 407 for converting a signal in the time domain into a frequency-domain signal, to prevent signal interference CP inserter for inserting a CP to the front part of OFDM data in order to (408 ) and provided with a transmission method and a HRPD-compatible processor for compatibility (415) and, EV-DO transmitter 411 and a MIMO pilot inserter for inserting a MIMO pilot for the HRPD system (310) of the HRPD system. 상기 확산기(406)는 예를 들어 QPSK(Quadrature Phase Shift Keying) 확산기를 이용할 수 있다. The diffuser 406 may utilize the example QPSK (Quadrature Phase Shift Keying) spreader. G.
또한 본 발명에서 상기 송신기는 전송 방식에 따라 MIMO를 지원하는 OFDM 전송 방식을 따를 경우 전용 파일럿으로 MIMO 파일럿 톤을 전송하도록 MIMO 파일럿 톤 삽입기(405)를 선택하여 동작시키고, MIMO를 지원하는 EV-DO 전송 방식을 따를 경우 전용 파일럿으로 MIMO 파일럿을 전송하도록 MIMO 파일럿 삽입기(410)를 선택하여 동작시키는 MIMO 인터레이스 선택기(412)와, 전송 방식에 따라 OFDM 신호 또는 EV-DO 신호를 출력하도록 다중화기(409)를 제어하여 OFDM 신호 또는 EV-DO 신호의 전송을 선택하는 OFDM/EV-DO 선택기(413)를 구비한다. In addition, the transmitter and operation to select a MIMO pilot tone inserter 405 to transmit the MIMO pilot tone in the dedicated pilot will follow if the OFDM transmission scheme supporting the MIMO transmission system according to the present invention, EV- supporting MIMO MIMO interlace selector 412 and the multiplexer to output the OFDM signal or the EV-DO signals according to the transmission method of operating by selecting the MIMO pilot inserter 410 to transmit a MIMO pilot to dedicated pilot when following the DO transmission scheme It controls 409 to and a OFDM / EV-DO selector 413 to select the transmission of an OFDM signal or an EV-DO signal. 그리고 MIMO를 지원하지 않을 경우 즉, NON-MIMO 인터레이스일 경우 상기 MIMO 인터레이스 선택기(412)는 MIMO 전용 파일럿으로 MIMO 파일럿 톤이나 MIMO 파일럿이 삽입되지 않도록 MIMO 파일럿 톤 삽입기(405)와 MIMO 파일럿 삽입기(410)의 동작을 제어한다. And if not supporting MIMO that is, NON-MIMO interlaced one, if the MIMO interlace selector 412 so that it is not MIMO pilot tone or a MIMO pilot inserting a MIMO dedicated pilot MIMO pilot tone inserter 405 and the MIMO pilot inserter It controls the operation of the unit 410. 이 경우 송신기는 일반적인 OFDM 전송 방식을 따르거나 EV-DO 전송 방식을 따르게 된다. In this case the transmitter is to follow the general OFDM transmission scheme or the EV-DO transmission scheme follow. 따라서 MIMO를 이용하는 OFDM, EV-DO 사용자와 MIMO를 이 용하지 않는 OFDM, EV-DO 사용자가 공존하는 시스템에서는 MIMO 지원을 위한 MIMO 파일럿 톤이나 MIMO 파일럿의 할당을 위한 인터레이스를 고정적으로 배치하는 것이 바람직 할 것이다. Therefore, the system of the OFDM, EV-DO user and the MIMO using a MIMO does OFDM, a co-EV-DO user not for desirable to place an interlace for allocation of the MIMO pilot tone or a MIMO pilot for MIMO support fixedly something to do. 그리고 제어기(414)는 MIMO 인터레이스의 할당 여부를 확인하여 MIMO 인터레이스 선택기(412)의 동작을 제어하고, 현재 슬롯이 OFDM 사용자를 위한 전송인지 또는 EV-DO 사용자를 위한 전송인지 확인하여 OFDM/EV-DO 선택기(413)의 동작을 제어한다. And a controller 414 to determine whether to make an allocation if the MIMO interlace control the operation of the MIMO interlace selector 412, and transmits to the transmission or an EV-DO user for the user, the current OFDM slot OFDM / EV- It controls the operation of the DO selector 413. 본 발명에서 OFDM 전송 방식이나 MIMO-OFDM 전송 방식을 위한 기지국의 송신 과정은 다음과 같다. Transmission process of a base station for the OFDM transmission scheme or the MIMO-OFDM transmission system in the present invention are as follows. 상위 계층에서 만들어진 물리 계층 패킷 데이터는 채널 부호화기(401)에 입력되어 채널 부호화되고, 채널 부호화된 비트열은 다이버시티(diversity) 이득을 얻기 위해 채널 인터리버(402)를 통해 섞이게 된다. Physical layer packet data generated in an upper layer is encoded is the input channel to the channel encoder 401, a bit stream that is coded channels are mixed via a channel interleaver 402 to obtain diversity (diversity) benefits. 인터리빙된 비트열은 변조기(403)로 입력되어 변조 신호로 변환된다. The interleaved bit stream is input to the modulator 403 is converted to a modulated signal. 여기서 변조 신호는 도 3의 슬롯 구조에서 데이터 전송 구간의 데이터 톤(data Tone)에 배치된다. The modulation signal is arranged in data tones (Tone data) of the data transmission interval of the slot structure of FIG. 그리고 경계톤 삽입기(404)는 변조기(403)에서 출력된 신호의 대역 경계 부근에 경계톤을 배치한다. And the guard tone inserter 404 places the guard tone in the vicinity of the band boundary of the signal output from the modulator 403. 여기서 MIMO-OFDM 전송 방식의 경우 기지국의 송신기에서 MIMO 인터레이스 선택기(412)는 MIMO 파일럿 톤 삽입기(405)의 동작을 제어하여 할당된 인터레이스에 MIMO 파일럿 톤을 삽입한다. Here, in the case of MIMO-OFDM transmission scheme MIMO interlace selector 412 in the transmitter of the base station inserts a MIMO pilot tones on interlace assigned to control the operation of the MIMO pilot tone inserter 405. 일반적인 OFDM 전송 방식의 경우 상기 MIMO 파일럿 톤의 삽입 동작은 생략된다. For a general OFDM transmission scheme insertion operation of the MIMO pilot tone thereof it is omitted. 일반적인 OFDM 전송 방식을 따를 경우 HRPD 호환 처리기(415)에서 일반적인 EV-DO 시스템의 파일럿 신호만을 삽입하여 전송하게 된다. When following the general OFDM transmission system it is transmitted by inserting only the pilot signal of a typical EV-DO system in the HRPD compatible processor 415. 상기와 같은 동작에 따라 모든 톤에 전송될 신호가 할당되면, 확산기(406)는 예컨대 QPSK 확산을 수행하고, 이러한 QPSK 확산 과정을 통해 서로 다른 정보를 전송하는 기지국의 신호는 서로 다른 복소 PN(Pseudo Noise) 열이 곱해지게 된다. When a signal is sent to all the tones in accordance with an operation, such as the assignment, the diffuser 406 is, for example, do the QPSK spread, and the signal of the base station to transmit different information over such a QPSK spread process, different complex PN (Pseudo Noise) will be multiplied by the heat. 여기서 복소 PN 열이란 실수 성분과 허수 성분이 모두 PN 코드로 구성된 복소수열을 의미한다. The complex PN sequence is both a real component and an imaginary component means a complex array constituted from a PN code. 상기 QPSK 확산 과정을 거친 변조 신호들은 IFFT 처리기(407)에서 IFFT 처리되어 원하는 주파수 톤의 위치에 놓이게 된다. Modulated signal subjected to the QPSK spread process, the IFFT are processed by the IFFT processor 407 is placed in the position of a desired frequency tone. 그리고 CP 삽입기(408)는 다중경로 페이딩에 따른 자기 간섭 효과를 방지하기 위한 목적으로 IFFT 처리된 OFDM 데이터에 CP를 삽입하여 OFDM 심볼을 생성한다. And the CP inserter 408 generates an OFDM symbol by inserting a CP to the OFDM data of the IFFT processing in order to avoid self-interference effect due to multipath fading. 상기 MIMO 파일럿 톤이 삽입된 OFDM 심볼은 OFDM/EV-DO 선택기(413)의 제어에 따라 다중화기(409)를 통하여 HRPD 호환처리기(415)로 전달된다. The OFDM symbols, to which the MIMO pilot tone is inserted is transmitted to the HRPD compatible processor 415 through the multiplexer 409 under the control of the OFDM / EV-DO selector 413. 그리고 HRPD 호환 처리기(415)는 도 3의 슬롯 구조에 따라 전송 데이터와 함께 파일럿 신호(303, 308)와 MAC 신호(302, 304, 307, 309)가 TDM 방식으로 다중화되도록 HRPD 시스템의 호환 처리를 수행한다. And the HRPD compatible processor 415 for compatibility processing of the HRPD system, a pilot signal (303, 308) and MAC signals (302, 304, 307, 309) to be multiplexed in a TDM manner with the transmission data according to the slot structure of Figure 3 performed. 따라서 도 4의 송신기를 통해 최종적으로는 전송되는 무선 신호는 상기 도 3에 도시된 바와 같은 슬롯 구조를 가지게 된다. Therefore, a radio signal is finally transmitted over the transmitter of Figure 4 will have a slot structure as illustrated in the FIG. 본 발명에서 일반적인 EV-DO 전송 방식과 MIMO를 지원하는 EV-DO 전송 방식을 위한 기지국의 송신 과정은 다음과 같다. Transmission process of a base station for the EV-DO transmission scheme that supports the common EV-DO transmission scheme and the MIMO in the present invention are as follows. MIMO를 지원하는 EV-DO 전송 방식을 수행할 경우 송신기의 MIMO 인터레이스 선택기(412)는 EV-DO 송신기(411)로부터 송신 신호를 전달받은 MIMO 파일럿 삽입기 (405)의 동작을 제어하여 할당된 인터레이스에 MIMO 파일럿을 삽입한다. MIMO interlace selector 412 of the transmitter if you do the EV-DO transmission scheme that supports MIMO is an interlace assigned to control the operation of the MIMO pilot insertion received the transmission signal from the EV-DO transmitter 411, group 405 to insert the MIMO pilot. MIMO 파일럿이 삽입된 신호는 OFDM/EV-DO 선택기(413)의 제어에 따라 다중화기(409)를 통해 HRPD 호환 처리기(415)로 전달된다. The MIMO pilot signal is inserted is transmitted to the HRPD compatible processor 415 through the multiplexer 409 under the control of the OFDM / EV-DO selector 413. 그리고 HRPD 호환 처리기(415)는 도 3의 슬롯 구조에 따라 전송 데이터와 함께 파일럿 신호(303, 308)와 MAC 신호(302, 304, 307, 309)가 TDM 방식으로 다중화되도록 HRPD 시스템의 호환 처리를 수행한다. And the HRPD compatible processor 415 for compatibility processing of the HRPD system, a pilot signal (303, 308) and MAC signals (302, 304, 307, 309) to be multiplexed in a TDM manner with the transmission data according to the slot structure of Figure 3 performed. 일반적인 EV-DO 전송 방식을 수행할 경우 MIMO 파일럿 삽입기(405)를 통한 MIMO 파일럿의 삽입 동작은 생략된다. When performing the normal EV-DO transmission scheme insertion operation of the MIMO pilot over the MIMO pilot inserter 405 is omitted. 즉 일반적인 EV-DO 전송 방식을 따를 경우 HRPD 호환 처리기(415)에서 일반적인 EV-DO 시스템의 파일럿 신호만을 삽입하여 전송하게 된다. That is, to follow the common EV-DO transmission scheme by inserting only the pilot signal of a typical EV-DO system in the HRPD compatible processor 415 is transmitted. 한편 도 4의 송신기 구조에서 예를 들어 MIMO 파일럿 톤이나 MIMO 파일럿이 삽입되는 인터레이스가 고정되어 있고, HRPD 시스템에서 MIMO 전용 전송 방식으로 MIMO OFDM이나 MIMO EV-DO 중 하나의 전송 방식으로 송신기를 구성하는 것도 가능할 것이다. In Fig., For example in the structure of the transmitter in the 4 and interlacing is the MIMO pilot tone or a MIMO pilot insertion is fixed, in the HRPD system, a MIMO-only transmission mode to configure the transmitter to a transmission method in the MIMO OFDM and MIMO EV-DO it will be possible. 이하에서는 도 5a 내지 도 5c를 참조하여 본 발명의 HRPD 시스템에서 MIMO를 지원하는 OFDM 전송 방식 및 EV-DO 전송 방식을 수행할 경우 MIMO 파일럿 톤과 MIMO 파일럿의 배치 방식을 설명하기로 한다. In reference to Figures 5a to 5c also the case to perform the OFDM transmission scheme and EV-DO transmission scheme supporting the MIMO in the HRPD system according to the present invention will be described in the configuration mode of the MIMO pilot tones and the MIMO pilot. 도 5a는 본 발명의 실시 예에 따른 HRPD 시스템의 순방향 링크에서 MIMO를 지원하는 OFDM 전송 방식을 수행할 경우 MIMO 파일럿 톤의 배치 예를 도시한 것이다. Figure 5a illustrates an arrangement for a MIMO pilot tones when to perform OFDM transmission scheme supporting the MIMO in the forward link of the HRPD system according to an embodiment of the present invention. 일반적인 EV-DO 또는 OFDM 전송 방식을 따를 경우 상기한 바와 같이 HRPD 호 환 처리기(415)에서 삽입되는 파일럿 신호를 그대로 이용할 수 있다. If it follows a typical EV-DO transmission scheme or OFDM may be used as it is a pilot signal that is inserted in HRPD-compatible processor 415, as described above. 그러나 MIMO가 지원되는 단말의 경우 기존의 파일럿 신호(502)를 통해서는 다중 안테나의 채널을 추정할 수 없으므로 본 발명에서는 데이터 톤(503)이 배치되는 데이터 전송 영역에 MIMO 전용으로 MIMO 파일럿 톤(504)을 배치한다. However, if the terminal which MIMO is supported, in the present invention will not be able to estimate the channel of the multi-antenna MIMO pilot tone as MIMO dedicated to data transmission region in which the data tones 503 are placed through the existing pilot signal 502 (504 ) is arranged to. 상기 MIMO 파일럿 톤(504)는 한 슬롯에서 시간과 주파수 영역에서 다양한 형태로 사용할 수 있다. The MIMO pilot tone 504 may be used in a slot in a variety of forms in the time and frequency domain. 도 5a의 배치 예는 주파수 다이버시티를 향상시키도록 한 것이고, 이와 달리 시간 영역과 주파수 영역에서 다양한 형태로 MIMO 파일럿 톤(504)을 배치할 수도 있다. Figure 5a arrangement of the example may be to place the MIMO pilot tones 504 in various forms in a will to improve frequency diversity, alternatively the time domain and the frequency domain. 본 발명은 MIMO 전용으로 파일럿 톤을 배치하는 예에 국한되지 않고 변형될 수 있는 모든 예를 포함한다. The present invention includes all of these examples can be modified without being limited to, for example, placing a pilot tone in a MIMO-only. 도 5b 및 도 5c는 본 발명의 실시 예에 따른 HRPD 시스템의 순방향 링크에서 MIMO를 지원하는 EV-DO 전송 방식을 수행할 경우 MIMO 파일럿의 배치 예를 도시한 것이다. Figure 5b and Figure 5c illustrates the arrangement of the MIMO pilot for example, when performing the EV-DO transmission scheme supporting the MIMO in the forward link of the HRPD system according to an embodiment of the present invention. 먼저 도 5b는 기존 파일럿 신호 영역(502)에 MIMO 파일럿(505)을 부호분할다중(CDM)하여 삽입한 것이고, 도 5c는 기존 데이터 전송 영역(506)에 MIMO 파일럿(507)을 CDM하여 삽입한 것이다. First, in FIG. 5b will have inserted the MIMO pilot 505, a code division multiplexing (CDM) to an existing pilot signal region 502, Figure 5c is inserted by CDM a MIMO pilot 507, the existing data transmission region 506 will be. 도 6a는 본 발명의 실시 예에 따른 HRPD 시스템의 순방향 링크에서 MIMO 사용자를 위한 인터레이스를 고정으로 할당하는 이유를 설명하기 위한 도면이다. Figure 6a is a view for explaining the reason for assigning interlace for MIMO users to fixed on the forward link of the HRPD system according to an embodiment of the present invention. MIMO를 지원하는 OFDM 시스템 및 EV-DO 시스템과, 일반적인 OFDM 시스템 및 EV-DO 시스템이 공존하는 본 발명의 HRPD 시스템에서는 도 6a와 같이 MIMO 사용자의 단말로부터 기지국으로 전송되는 다중 안테나에 대한 피드백(CQI) 정보(601)를 이용할 수 있다. In the OFDM system and the EV-DO system, a typical OFDM system and the EV-DO system, the HRPD system of the present invention to co-exist to support MIMO FIG feedback for multi-antenna to be transmitted to the base station from the terminal MIMO user, such as 6a (CQI ) may utilize information 601. 기지국의 송신기가 단말로부터 피드백(CQI) 정보(601)를 수신하는 경우 다음 전송에서 MIMO 파일럿 톤과 MIMO 파일럿의 전력 등을 제어할 수 있다. If the transmitter of the base station that receives the feedback (CQI) information 601 from the terminal it is possible to control the MIMO pilot and MIMO pilot tone power in the next transmission. 이 경우 MIMO 파일럿 톤과 MIMO 파일럿의 전송을 위해 고정으로 할당된 인터레이스를 사용하게 되면, 기지국에서 복잡한 상위 제어신호를 사용하지 않고도 간단히 MIMO 사용자를 지원할 수 있게 된다. In this case, The use of an interlace assigned to the fixing for the transmission of the MIMO pilot and MIMO pilot tones, it is possible to easily support the MIMO user without the need for complex high-control signal at the base station. 즉 기지국은 제어신호를 통해 단말로 MIMO 전용으로 어떤 인터레이스를 사용할 것인가를 알려주고, 기지국에서는 MIMO 전용으로 고정 할당된 인터레이스로 MIMO 사용자의 데이터를 전송한다. I.e., the base station informs whether to use the interlace in which the terminal through a dedicated MIMO control signal, the base station transmits data of a MIMO user in a fixed assignment interlace only with MIMO. 그리고 단말은 기지국으로부터 수신한 제어신호를 이용하여 자신에게 할당된 인터레이스를 통해 데이터를 수신한다. And the terminal receives the data via the interlaces assigned to them by using the control signal received from the base station. 도 6b는 본 발명의 실시 예에 따른 HRPD 시스템의 순방향 링크에서 MIMO 전용으로 인터레이스가 고정으로 할당된 예를 도시한 도면이다. Figure 6b is a diagram showing an example of an interlace assigned to the MIMO to a fixed only in the forward link of the HRPD system according to an embodiment of the present invention. 도 6b를 살펴보면, 인터레이스 0(602)은 MIMO 전용으로 할당되어 있고, 나머지 인터레이스 1, 2, 3(603, 604, 605)은 TDM으로 전송되는 기존의 파일럿 신호를 이용하는 예컨대, 일반적인 EV-DO rev.A/B의 사용자와, 일반적인 OFDM 사용자를 위한 데이터 전송용으로 할당되어 있다. FIG Referring to 6b, interlace 0 602 is assigned to the MIMO-only, and the remaining interlaces 1, 2 and 3 (603, 604, 605), for example using the existing pilot signal transmitted by TDM, a typical EV-DO rev and the .A / B user, is allocated for the transmission of data for the general OFDM user. 따라서 인터레이스 0(602)을 통해서는 MIMO를 지원하는 OFDM, EV-DO 사용자의 데이터 전송이 가능하다. Therefore, it is possible to OFDM, EV-DO user of the data transmission to support MIMO interlaces 0 through 602. 도 6b에서 참조번호 606 내지 608은 인터레이스 0(602)을 통해 각각 도 5a 내지 도 5c의 배치에 따라 MIMO 파일럿 톤이나 MIMO 파일럿이 삽입되어 전송되는 슬롯 구조를 간략히 도식적으로 나타낸 것이다. Figure reference numbers 606 to 608 in 6b illustrates a slot structure in which the transmission is a MIMO pilot or a MIMO pilot tone is inserted in accordance with the arrangement of Figure 5a to 5c respectively through interlace 0 602 a brief illustrative. 또한 도 6b에서 참조번호 609, 610은 각각 일반적인 OFDM 사용자와 EV-DO 사용자를 위한 파일럿 신호가 기존과 같이 TDM으로 전송되는 슬롯 구조를 나타낸 것이다. In addition, reference numerals 609, 610 in FIG. 6b illustrates a slot structure that is sent to an existing TDM as a pilot signal for a common OFDM user and the EV-DO for each user. 도 7은 본 발명의 실시 예에 따른 HRPD 시스템의 순방향 링크에서 MIMO 인터레이스의 할당 여부에 따른 송신 과정을 도시한 순서도이다. 7 is a flowchart illustrating a transmission procedure according to whether the allocation of the MIMO interlace on the forward link of the HRPD system according to an embodiment of the present invention. 도 7의 701 단계에서 송신기의 제어기(414)는 현재 전송할 슬롯이 MIMO 인터레이스 슬롯인지를 확인한다. Controller 414 of the transmitter in step 701 of Figure 7 confirms whether the current transmission slot is slot interlace MIMO. 현재 전송할 슬롯이 MIMO 인터레이스인 경우 702 단계에서 제어기(414)는 MIMO-OFDM 사용자를 위한 전송인지 MIMO EV-DO 사용자를 위한 전송인지 결정하여 해당 전송 방식에 따른 동작을 수행한다. The current transmission slot when the MIMO interlace controller 414 in step 702 determines that the transmission for a transmission that the EV-DO MIMO users for MIMO-OFDM user and performs an operation based on the transmission method. 상기 702 단계에서 EV-DO 사용자를 위한 전송으로 결정된 경우 703 단계로 진행하여 송신기는 일반적인 EV-DO 전송 처리를 수행한다. When it is determined in the step 702 as a transport for the EV-DO user proceeds to step 703 to transmitter performs the normal EV-DO transmission process. 이후 704 단계에서 제어기(414)의 제어에 따라 MIMO 인터레이스 선택기(412)는 MIMO 파일럿 삽입기(410)를 동작시켜 송신 신호에 MIMO 파일럿을 삽입한다. Since in step 704 according to the control of the controller (414) MIMO interlace selector 412 operates the MIMO pilot inserter 410 inserts a MIMO pilot to the transmission signal. 이때 MIMO 인터레이스 선택기(412)는 예를 들어 도 5b와 같이 기존 파일럿 신호 영역(502)에 MIMO 파일럿(505)을 부호분할다중(CDM)하여 삽입하거나 기존 데이터 전송 영역(506)에 MIMO 파일럿(507)을 CDM 방식으로 삽입하여 전송할 수 있다. The MIMO pilot (507 in MIMO interlace selector 412, for example, the existing pilot signal region 502, a MIMO pilot 505, code division multiple (CDM) is inserted or an existing data transfer region 506 by a as shown in Fig. 5b ) it can be transferred by inserting the CDM scheme. 이후 OFDM/EV-DO 선택기(413)의 제어에 따라 다중화기(409)는 MIMO 파일럿이 삽입된 신호를 출력시키고, 705 단계에서 송신기의 HRPD 호환 처리기(415)는 HRPD 시스템과의 호환을 위해 도 2의 참조번호 208과 같이 데이터 채널, MAC 채널 그리고 파일럿 채널을 TDM 전송하는 호환 처리를 수행하고, 706 단계에서 TDM으로 다중화된 신호를 반송파에 실어 무선망으로 송출한다. Since OFDM / EV-DO selector 413, a multiplexer 409 under the control of the will and outputs a signal of the MIMO pilot insertion, HRPD-compatible processor 415 of the transmitter in step 705 is also for compatibility with HRPD system a data channel, MAC channel and the pilot channel as shown in the second reference number of TDM 208 performs a compatibility processing operation of transmitting and carries a signal multiplexed according to TDM in step 706 the carrier wave and transmits the radio network. 한편 상기 702 단계에서 OFDM 사용자를 위한 전송으로 결정된 경우 송신기는 707 단계로 진행하여 전송할 데이터를 부호화하고, 인터리빙한 후, 변조하여 데이터 톤을 발생시킨다. On the other hand, if determined in the step 702 to the transmission for a user OFDM transmitter to generate a coded and then the data to be transferred proceeds to step 707, and interleaved, modulated by the data tones. 이후 708 단계에서 송신기의 경계톤 삽입기(404)는 변조 신호 의 대역 경계 부근에 경계 톤(Gurard Tone)을 삽입하고, 709 단계에서 MIMO 파일럿 톤 삽입기(405)는 MIMO 인터레이스 선택기(412)의 제어에 따라 할당된 인터레이스에 예컨대, 도 5a와 같이 MIMO 파일럿 톤을 삽입한다. Since transmitter guard tone inserter 404 in step 708 inserts a guard tone (Gurard Tone) at the band boundary of the modulation signal, MIMO pilot tone inserter 405 in the 709 phase of the MIMO interlace selector 412 for example, the interlace assigned in accordance with the control, and inserts the MIMO pilot tone as shown in Fig. 5a. 이후 모든 톤에 전송될 신호가 할당되면, 710 단계에서 확산기(406)는 예컨대 QPSK 확산을 수행하고, QPSK 확산 과정을 거친 변조 신호들은 IFFT 처리기(407)에서 IFFT 처리되어 원하는 주파수 톤의 위치에 놓이게 된다. Thereafter, if a signal is sent to all tone allocation, spreader 406 in step 710 is, for example, do the QPSK spread, and modulated signal subjected to QPSK spreading process are the IFFT processing in the IFFT processor 407 is placed in the position of a desired frequency tone do. 그리고 711 단계에서 CP 삽입기(408)는 자기 간섭 효과를 방지하도록 IFFT 처리된 OFDM 데이터에 CP를 삽입하여 OFDM 심볼을 생성한다. And the CP inserter 408 at step 711 generates an OFDM symbol by inserting a CP to the OFDM data of the IFFT processing to prevent magnetic interference. 이후 OFDM/EV-DO 선택기(413)의 제어에 따라 다중화기(409)는 MIMO 파일럿 톤이 삽입된 OFDM 신호를 출력시키고, 712 단계에서 송신기의 HRPD 호환 처리기(415)는 HRPD 시스템과의 호환을 위해 데이터 채널, MAC 채널 그리고 파일럿 채널을 TDM 전송하는 호환 처리를 수행하고, 706 단계에서 TDM으로 다중화된 신호를 반송파에 실어 무선망으로 송출한다. Since OFDM / EV-DO multiplexer 409 under the control of the selector 413 and outputs the OFDM signal MIMO pilot tone is inserted, HRPD-compatible processor 415 of the transmitter in the 712 step is compatible with the HRPD system to perform a compatibility processing operation to transfer the data channel, MAC channel and TDM pilot channel, and carries the signal multiplexed in step 706 to the TDM carrier it will be sent out to a radio network. 한편 상기 701 단계에서 기지국의 송신기는 현재 전송할 슬롯이 MIMO 인터레이스 슬롯이 아닌 것으로 확인된 경우 714 단계에서 송신기는 OFDM 사용자를 위한 전송인지 EV-DO 사용자를 위한 전송인지 결정하여 해당 전송 방식에 따른 동작을 수행한다. The transmitter of a base station in the 701 step is the current transmission slot if found to be non-MIMO interlaced slots in a 714 phase transmitter to determine that the transmission for the EV-DO user that the transmission for a OFDM user operation in accordance with the transmission method performed. NON-MIMO OFDM 사용자를 위한 전송 과정을 나타낸 718 단계 내지 723 단계의 동작은 도 7의 709 단계에 따른 MIMO 파일럿 톤의 삽입 동작을 제외하고 707 단계 내지 713 단계의 동작과 동일하며, NON-MIMO EV-DO 사용자를 위한 전송 과정을 나타낸 715 단계 내지 717 단계의 동작은 도 7의 704 단계에 따른 MIMO 파일럿의 삽입 동작을 제외하고 715 단계 내지 717 단계의 동작과 동일하므로 그 상세한 설명은 생략하기로 한다. NON-MIMO except for OFDM insertion operation of the MIMO pilot tones in accordance with operation 709 steps in FIG. 7 of the 718 steps showing a transmission process to 723 steps for a user, and the same as the operation of step 707 to step 713 and, NON-MIMO EV -DO except for the insertion operation of the MIMO pilot in accordance with step 704 of the transmission process step 715 to step 717 operation is shown in Figure 7 for the users, and the same as that of step 715 to step 717 operates so that the description will be omitted . 이하에서는 도 8 내지 도 11을 참조하여 각 전송 방식별로 본 발명에 따른 수신기의 구조를 설명하기로 한다. Hereinafter, with reference to Figs. 8 to 11 will be described in the structure of the receiver according to the invention for each transmission method. 하기 도 8 내지 도 11의 수신기는 설명의 편의상 NON-MIMO EV-DO, MIMO EV-DO, NON-MIMO OFDM 및 MIMO OFDM 방식을 따르는 수신기를 각각 도시한 것이다. To the receiver of FIG. 8 to 11 is respectively shown for convenience NON-MIMO EV-DO, MIMO EV-DO, the receiver according to the NON-MIMO OFDM and MIMO OFDM way of illustration. 실제 단말을 구현할 경우 위 4 가지 방식의 수신기 중 적어도 하나를 단말 내에 구현할 수 있을 것이다. When implementing an actual terminal will be able to implement at least one of the four terminals in the manner of the above receiver. 이 경우 단말은 기지국과 미리 약속된 전송 방식 또는 기지국의 제어 신호에서 지시된 전송 방식에 따라 해당되는 수신기를 통해 순방향 링크 신호를 수신할 수 있다. In this case, the terminal may receive the forward link signal through the receiver applicable in accordance with the transmission mode indicated by the control signal of the pre-promised transmission system or a base station and a base station. 도 8은 본 발명의 실시 예에 따른 HRPD 시스템의 순방향 링크에서 전송 방식이 NON-MIMO EV-DO인 경우 수신기의 구조를 도시한 블록도이다. 8 is a diagram illustrating a structure of a receiver if the transmission mode is NON-MIMO EV-DO forward link of the HRPD system according to an embodiment of the present invention. 도 8의 수신기에서 HRPD 호환 처리기(901)는 도 4의 HRPD 호환 처리기(415)의 역과정으로 동작되어 TDM으로 다중화된 데이터 채널과, MAC 채널과, 파일럿 채널의 신호를 역다중화하여 전달한다. HRPD compatible processor 901 in the receiver of FIG. 8 is operated in the reverse process of the HRPD compatible processor 415 of Figure 4 transfers the demultiplexed signals of the data channel, MAC channel and a pilot channel multiplexed in TDM. 상기 EV-DO 복조기(802)는 HRPD 호환 처리기(901)의 역다중화된 신호중 데이터 채널을 전달받아 예컨대, EV-DO rev. The EV-DO demodulator 802 receives the demultiplexed data channel sinhojung the HRPD compatible processor 901, e.g., EV-DO rev. A/B 방식으로 전송된 데이터를 복조한다. It demodulates the data transmitted by A / B system. 상기 EV-DO 복조기(802)는 공지된 기술이므로 그 상세한 설명은 생략하기로 한다. The EV-DO demodulator 802 because it is a known technique, the detailed description thereof will be omitted. 도 9는 본 발명의 실시 예에 따른 HRPD 시스템의 순방향 링크에서 전송 방식이 MIMO EV-DO인 경우 수신기의 구조를 도시한 블록도이다. 9 is a diagram illustrating a structure of a receiver when the transmission scheme of EV-DO at the MIMO forward link of the HRPD system according to an embodiment of the present invention. 도 9의 수신기에서 HRPD 호환 처리기(901)는 도 4의 HRPD 호환 처리기(415)의 역과정으로 동작되어 TDM으로 다중화된 데이터 채널과, MAC 채널과, 파일럿 채널의 신호를 역다중화하여 전달한다. HRPD compatible processor 901 in the receiver of Figure 9 is operated in the reverse process of the HRPD compatible processor 415 of Figure 4 transfers the demultiplexed signals of the data channel, MAC channel and a pilot channel multiplexed in TDM. MIMO 파일럿 추출기(902)는 이중에서 도 5b 또는 도 5c와 같이 데이터 채널의 영역 또는 파일럿 채널의 영역에 삽입된 MIMO 파일럿을 이용하여 채널을 추정하고 데이터에 해당되는 신호를 출력한다. MIMO pilot extractor 902 estimates a channel using a MIMO pilot insertion in the area of ​​the region or the pilot channel of the data channel as shown in Figure 5b or Figure 5c double and outputs the signal corresponding to the data. 그리고 데이터에 해당되는 신호를 전달받은 EV-DO 복조기(903)은 예컨대, EV-DO rev. EV-DO and the demodulator 903 received the signal corresponding to data, for example, EV-DO rev. A/B 방식으로 전달받은 신호를 복조한다. It demodulates the signal transmitted to the A / B system. 도 10은 본 발명의 실시 예에 따른 HRPD 시스템의 순방향 링크에서 전송 방식이 NON-MIMO OFDM인 경우 수신기의 구조를 도시한 블록도이다. 10 is a diagram illustrating a structure of a receiver if the transmission mode is NON-MIMO OFDM on the forward link of the HRPD system according to an embodiment of the present invention. 도 10의 수신기에서 HRPD 호환 처리기(1001)는 도 4의 HRPD 호환 처리기(415)의 역과정으로 동작되어 TDM으로 다중화된 데이터 채널과, MAC 채널과, 파일럿 채널의 신호를 역다중화하여 전달한다. HRPD compatible processor 1001 in the receiver of Figure 10 is operated in the reverse process of the HRPD compatible processor 415 of Figure 4 transfers the demultiplexed signals of the data channel, MAC channel and a pilot channel multiplexed in TDM. 전달된 신호중 파일럿 신호는 채널 추정기(1007)로 전달되며, 데이터 신호는 CP 제거기(1002)로 전달되고, CP 제거기(1002)는 수신된 신호에서 전파 지연 및 다중 경로 등으로 인하여 오염된 CP를 제거한다. Passed sinhojung pilot signal is transmitted to the channel estimator 1007, a data signal is transmitted to the CP remover 1002, CP remover 1002 removes the contaminated CP due to propagation delay and multi-path, etc. in the received signal do. FFT 처리기(1003)는 입력된 시간 영역의 신호를 주파수 영역의 신호로 변환하여 출력하며, QPSK 역확산기(1004)는 상기 주파수 영역의 신호를 QPSK 역확산하여 각 신호의 톤들이 출력된다. FFT processor 1003 and converts the input signal of the time domain into signal in the frequency domain, QPSK despreader 1004 is output to the tone of each QPSK signal by despreading the signal in the frequency domain. 이는 송신기에서 QPSK 확산되어 신호가 전송됨을 가정한 경우이다. This is the assumption that the QPSK spreading in the transmitter signal is transmitted. 따라서 송신기에서 확산 방식이 다른 경우 해당 확산 방식에 대응되는 역확산기가 구비된다. Therefore, at the transmitter is provided with a diffusion method is different despreaders corresponding to the spreading system. 역확산된 각 신호의 톤들은 데이터톤 추출기(1006)로 전달되며, 상기 데이터 톤 추출기(1006)는 전달받은 신호로부터 데이터 톤을 추출한다. Inverse tone of each of the spreading signals are passed to a data tone extractor 1006, and the data tone extractor 1006 extracts data tones from the signal received. 한편 채널 추정기(1007)는 전달된 파일럿 신호로부터 채널을 추정하고, 그 채널 추정값은 복조기(1008)로 전달된다. The channel estimator 1007 estimates the channel from the transmitted pilot signal, the channel estimate is transmitted to demodulator 1008. 상기 복조기(1008)는 전달받은 채널 추정값을 이용하여 데이터 톤의 복조를 수행하고, 복조된 신호는 디인터리버(1009)를 통해 디인터리빙되어 복호기(1010)로 입력된다. The demodulator 1008 performs demodulation of the data tones using the channel estimation value received and demodulated signal is deinterleaved by the deinterleaver 1009 is input to the decoder 1010. 그리고 복호기(1010)는 입력된 신호를 복호하여 전송된 신호를 복원한다. And decoder 1010 is to recover the transmitted signal by decoding the input signal. 도 11은 본 발명의 실시 예에 따른 HRPD 시스템의 순방향 링크에서 전송 방 식이 MIMO OFDM인 경우 수신기의 구조를 도시한 블록도로서, 도 11에서 도 10의 대응되는 구성 요소는 동일한 동작을 수행하므로 해당 구성 요소에 대한 상세한 설명은 생략하기로 한다. The Figure 11, so as a block diagram showing a structure of a receiver if the forward link transmission room expression MIMO OFDM of the HRPD system according to an embodiment of the present invention, the corresponding components of Figure 10 in Figure 11 performs the same operation detailed description of the components will be omitted. 도 11의 수신기에서 HRPD 호환 처리기(1101)는 도 4의 HRPD 호환 처리기(415)의 역과정으로 동작되어 TDM으로 다중화된 데이터 채널과, MAC 채널과, 파일럿 채널의 신호를 역다중화하여 전달한다. HRPD compatible processor 1101 in the receiver of Figure 11 is operated in the reverse process of the HRPD compatible processor 415 of Figure 4 transfers the demultiplexed signals of the data channel, MAC channel and a pilot channel multiplexed in TDM. 전달된 신호 중 파일럿 신호는 채널 추정기(1108)로 전달되며, 데이터 신호는 MIMO 인터레이스 선택기(1102)로 전달되고, MIMO 인터레이스 선택기(1102)는 수신 신호가 고정 할당된 인터레이스인지를 체크한 후, 수신 신호를 다음 단으로 전달한다. Of the signal transmitted pilot signal is transmitted to the channel estimator 1108, a data signal is then transmitted to the MIMO interlace selector 1102 and, MIMO interlace selector 1102 checks whether the received signal is a fixed assignment interlace, received and it delivers the signal to the next stage. 이후 수신 신호는 CP 제거기(1002)로 전달되고, CP 제거기(1102)는 수신 신호에서 전파 지연 및 다중 경로 등으로 인하여 오염된 CP를 제거한다. Since the received signal is transmitted to the CP remover 1002, and, CP remover 1102 removes a CP contaminated due to propagation delay and multiple paths such as in a received signal. FFT 처리기(1103)는 입력된 시간 영역의 신호를 주파수 영역의 신호로 변환하여 출력하며, QPSK 역확산기(1104)는 상기 주파수 영역의 신호를 QPSK 역확산하여 각 신호의 톤들이 출력된다. FFT processor 1103 and converts the input signal of the time domain into signal in the frequency domain, QPSK despreader 1104 is output to the tone of each QPSK signal by despreading the signal in the frequency domain. 이는 송신기에서 QPSK 확산되어 신호가 전송됨을 가정한 경우이다. This is the assumption that the QPSK spreading in the transmitter signal is transmitted. 따라서 송신기에서 확산 방식이 다른 경우 해당 확산 방식에 대응되는 역확산기가 구비된다. Therefore, at the transmitter is provided with a diffusion method is different despreaders corresponding to the spreading system. 도 11의 수신기는 채널 추정을 위한 MIMO 파일럿 톤 추출기(1106)를 구비하며, 역확산된 각 신호의 톤들은 MIMO 파일럿 톤 추출기(1106)로 전달되고, MIMO 파일럿 톤 추출기(1106)는 MIMO-OFDM 전용으로 할당된 인터레이스로부터 도 5a와 같이 데이터 채널의 영역에 삽입된 MIMO 파일럿 톤을 추출하여 채널 추정기(1108)로 전달하고, 데이터 톤 추출기(1107)는 데이터 영역으로부터 MIMO 파일럿 톤을 제외한 데이터 톤을 추출하여 복조기(1109)로 전달하는 방식으로 수신된 신호를 복원하게 된다. The receiver includes a MIMO pilot tone extractor 1106, inverse tone of each of the spread signals are transmitted to the MIMO pilot tone extractor 1106, a MIMO pilot tone extractor 1106 for channel estimation of Figure 11 MIMO-OFDM extracting the MIMO pilot tones inserted in the area of ​​the data channel as shown in Fig. the from the interlace assignment to a dedicated 5a and passed to channel estimator 1108, and data tone extractor 1107 is a data tones other than the MIMO pilot tone from the data area extract will restore a received signal by passing a demodulator 1109. 상기한 본 발명의 상세한 설명에서는 구체적인 실시 예에 관하여 설명하였으나, 본 발명의 범위에서 벗어나지 않는 한도 내에서 여러 가지 변형이 가능함은 물론이다. In the description of the present invention has been described with respect to specific embodiments, various modifications are possible within the limits that do not depart from the scope of the invention. 예를 들어 도 5a 내지 도 5c에서 설명한 MIMO 파이럿 톤 또는 MIMO 파일럿의 배치는 일 예를 든 것으로 다양한 형태의 배치가 가능함은 물론이다. For example, Figures 5a to MIMO pilot tone or a placing of the MIMO pilot is described in Figure 5c is a possible, as well as various types of arrangement to either one example. 또한 인터레이스 할당에 있어서 기지국내의 MIMO-OFDM 사용자의 수에 따라 고정 할당되는 인터레이스 id 및 개수는 달라질 수 있다. In addition, the interlace id, and the number to be allocated according to a fixed number of bases of the domestic user MIMO-OFDM according to the interlace assignment may be changed. 그러므로 본 발명의 범위는 설명된 실시 예에 국한되어 정해져서는 안되며 후술하는 발명청구의 범위뿐 만 아니라 이 발명청구의 범위와 균등한 것들에 의해 정해져야 한다. While the invention has been limited to the described embodiments it should not be jeonghaejyeoseo will be only as the scope of the claimed invention which will be described later as defined by the scope of the invention claims and their equivalents. 이상 설명한 바와 같이 본 발명에 의하면, HRPD 시스템과 호환성을 유지하는 EVDO 전송 방식 및 OFDM 방식 기반의 전송 기술을 이용하고, 고정으로 할당된 MIMO 인터레이스에 다중 안테나를 위한 MIMO 전용 파일럿/파일럿 톤을 전송하여 EV-DO, MIMO-EV-DO, OFDM, MIMO-OFDM 사용자가 공존하는 시스템에서 MIMO를 효과적으로 사용할 수 있다. Or more, according to the present invention as described above, using the EVDO transmission scheme and the OFDM scheme based on the transmission technology to maintain a HRPD system compatible, and transmits the MIMO dedicated pilot / pilot tone for the multi-antenna in the MIMO interlace assigned to fixed in EV-DO, MIMO-EV-DO, OFDM, MIMO-OFDM system, the user may use the MIMO coexistence effectively. 송신기와 수신기 사이에서 미리 정의된 TTI에서 시간 및 주파수의 결정된 위치에서 상기 제2 파일럿을 전송하는 단계를 포함하는 전송 방법. Transmitting comprises transmitting the second pilot on the pre-defined TTI between the transmitter and the receiver from the determined position of the time and frequency. 상기 데이터는 유저 데이터(user data) 또는 제어 데이터(control data)인 것을 특징으로 하는 전송 방법. The data transfer method, characterized in that the user data (user data) or a control data (control data). 상기 제1 파일럿은 상기 데이터를 위해 이용되는 것을 특징으로 하는 전송 방법. Wherein the first pilot is transmitted characterized in that used for the data. 상기 제2 파일럿은 복수의 안테나를 위해 이용되는 것을 특징으로 하는 전송 방법. Wherein said transmission characterized in that the second pilot is used for a plurality of antennas. 상기 제1 파일럿 및 상기 제2 파일럿은 동일한 TTI에서 전송되는 것을 특징으로 하는 전송 방법. The first pilot and the second pilot is transmitted characterized in that the transmission in the same TTI. 상기 제2 파일럿을 위한 시간 및 주파수의 상기 결정된 위치는 TDM(Time Division Multiplexing) or FDM(Frequency Division Multiplexing) or CDM(Code Division Multiplexing) or 적어도 하나의 TDM, FDM의 결합 or 상기 제1 파일럿을 위한 시간 및 주파수의 상기 결정된 위치를 가진 CDM에 의해 결정되는 것을 특징으로 하는 전송 방법. The determined position of the time and frequency for the second pilot is a TDM (Time Division Multiplexing) or FDM (Frequency Division Multiplexing) or CDM (Code Division Multiplexing) or the at least one TDM, the combination of FDM or for the first pilot transmission characterized in that the decision by the CDM with the determined positions of time and frequency. 상기 제2 파일럿은 상기 미리 정의된 TTI에서 시간 및 주파수안에서 산란된 패턴을 가지고 맵핑되는 복수의 심볼로 구성되는 것을 특징으로 하는 전송 방법. Wherein the second pilot is transmitted characterized in that consisting of a plurality of symbols mapped with a scattered pattern in the time and frequency in the pre-defined TTI. 송신기와 수신기 사이에서 미리 정의된 TTI에서 시간 및 주파수의 상기 결정된 위치에서 상기 제2 파일럿을 수신하는 단계를 포함하는 수신 방법. Method receiving comprises receiving the second pilot in a pre-defined TTI between the transmitter and the receiver from the determined position of the time and frequency. 상기 데이터는 유저 데이터(user data) 또는 제어 데이터(control data)인 것을 특징으로 하는 수신 방법. The data receiving method characterized in that the user data (user data) or a control data (control data). 상기 제1 파일럿은 상기 데이터를 위해 이용되는 것을 특징으로 하는 수신 방법. Wherein the first pilot is received characterized in that used for the data. 상기 제2 파일럿은 복수의 안테나를 위해 이용되는 것을 특징으로 하는 수신 방법. Wherein the second pilot is received characterized in that which is used for a plurality of antennas. 상기 제1 파일럿 및 상기 제2 파일럿은 동일한 TTI에서 전송되는 것을 특징으로 하는 수신 방법. The first pilot and the second pilot is received characterized in that the transmission in the same TTI. 상기 제2 파일럿을 위한 시간 및 주파수의 상기 결정된 위치는 TDM(Time Division Multiplexing) or FDM(Frequency Division Multiplexing) or CDM(Code Division Multiplexing) or 적어도 하나의 TDM, FDM의 결합 or 상기 제1 파일럿을 위한 시간 및 주파수의 상기 결정된 위치를 가진 CDM에 의해 결정되는 것을 특징으로 하는 수신 방법. The determined position of the time and frequency for the second pilot is a TDM (Time Division Multiplexing) or FDM (Frequency Division Multiplexing) or CDM (Code Division Multiplexing) or the at least one TDM, the combination of FDM or for the first pilot a receiving method, characterized in that, which is determined by the CDM with the determined positions of time and frequency. 상기 제2 파일럿은 상기 미리 정의된 TTI에서 시간 및 주파수 안에서 산란된 패턴을 가지고 맵핑되는 복수의 심볼로 구성되는 것을 특징으로 하는 수신 방법. Wherein the second pilot is received characterized in that consisting of a plurality of symbols mapped with a scattered pattern in the time and frequency in the pre-defined TTI. 데이터 전송을 위한 TTI(Transmission Time Interval)의 시간 및 주파수의 결정된 위치에서 상기 데이터 및 제1 파일럿을 전송하도록 하고, 송신기와 수신기 사이에서 미리 정의된 TTI에서 시간 및 주파수의 결정된 위치에서 상기 제2 파일럿을 전송하도록 상기 전송부를 제어하는 제어부를 포함하는 송신기. Wherein the in time and at the determined positions of frequency and to transmit the data and a first pilot, the transmitter and the determined position of the time and frequency at a pre-defined TTI between the receiver of the TTI (Transmission Time Interval) for data transmission, the second pilot the transmitter including a controller for controlling the transmission unit to transmit. 상기 데이터는 유저 데이터(user data) 또는 제어 데이터(control data)인 것을 특징으로 하는 송신기. It said data transmitter, characterized in that the user data (user data) or a control data (control data). 상기 제1 파일럿은 상기 데이터를 위해 이용되는 것을 특징으로 하는 송신기. Wherein the first pilot is a transmitter, characterized in that used for the data. 상기 제2 파일럿은 복수의 안테나를 위해 이용되는 것을 특징으로 하는 송신기. Wherein the second pilot is a transmitter, characterized in that to be used for a plurality of antennas. 상기 제1 파일럿 및 상기 제2 파일럿은 동일한 TTI에서 전송되는 것을 특징으로 하는 송신기. The first pilot and the second pilot is transmitted by the transmitter, characterized in that same TTI. 상기 제2 파일럿을 위한 시간 및 주파수의 상기 결정된 위치는 TDM(Time Division Multiplexing) or FDM(Frequency Division Multiplexing) or CDM(Code Division Multiplexing) or 적어도 하나의 TDM, FDM의 결합 or 상기 제1 파일럿을 위한 시간 및 주파수의 상기 결정된 위치를 가진 CDM에 의해 결정되는 것을 특징으로 하는 송신기. The determined position of the time and frequency for the second pilot is a TDM (Time Division Multiplexing) or FDM (Frequency Division Multiplexing) or CDM (Code Division Multiplexing) or the at least one TDM, the combination of FDM or for the first pilot transmitter characterized in that the decision by the CDM with the determined positions of time and frequency. 상기 제2 파일럿은 상기 미리 정의된 TTI에서 시간 및 주파수 안에서 산란된 패턴을 가지고 맵핑되는 복수의 심볼로 구성되는 것을 특징으로 하는 송신기. Wherein the second pilot is a transmitter, characterized in that consisting of a plurality of symbols mapped with a scattered pattern in the time and frequency in the pre-defined TTI. 데이터 전송을 위한 TTI(Transmission Time Interval)에서 전송되는 제1 파일럿의 시간 및 주파수의 위치를 결정하고, 데이터 전송을 위한 TTI에서 시간 및 주파수의 결정된 위치에서 상기 데이터 및 상기 제1 파일럿을 수신하도록 상기 수신부를 제어하며, 송신기와 수신기 사이에서 미리 정의된 TTI에서 전송되는 제2 파일럿의 시간 및 주파수의 위치를 결정하고, 송신기와 수신기 사이에서 미리 정의된 TTI에서 시간 및 주파수의 상기 결정된 위치에서 상기 제2 파일럿을 수신하도록 상기 수신부를 제어하는 제어부를 포함하는 수신기. Determining a position of the first pilot time and frequency of transmitted in a TTI (Transmission Time Interval) for data transmission, and wherein in the TTI for the data transmission at the determined position of the time and frequency to receive the data and the first pilot controls the reception unit, and determines a position of the second pilot time and frequency of transmitted in a pre-defined TTI between the transmitter and the receiver, wherein the transmitter and the time and the determined location of the frequency in the pre-defined TTI between receiver to receive a second pilot receiver including a controller to control the receiver. 상기 데이터는 유저 데이터(user data) 또는 제어 데이터(control data)인 것을 특징으로 하는 수신기. The data receiver, characterized in that the user data (user data) or a control data (control data). 상기 제1 파일럿은 상기 데이터를 위해 이용되는 것을 특징으로 하는 수신기. Wherein the first pilot is a receiver, characterized in that used for the data. 상기 제2 파일럿은 복수의 안테나를 위해 이용되는 것을 특징으로 하는 수신기. Wherein the second pilot is a receiver, characterized in that to be used for a plurality of antennas. 상기 제1 파일럿 및 상기 제2 파일럿은 동일한 TTI에서 전송되는 것을 특징으로 하는 수신기. The first pilot and the second pilot is a receiver characterized in that the transmission in the same TTI. 상기 제2 파일럿을 위한 시간 및 주파수의 상기 결정된 위치는 TDM(Time Division Multiplexing) or FDM(Frequency Division Multiplexing) or CDM(Code Division Multiplexing) or 적어도 하나의 TDM, FDM의 결합 or 상기 제1 파일럿을 위한 시간 및 주파수의 상기 결정된 위치를 가진 CDM에 의해 결정되는 것을 특징으로 하는 수신기. The determined position of the time and frequency for the second pilot is a TDM (Time Division Multiplexing) or FDM (Frequency Division Multiplexing) or CDM (Code Division Multiplexing) or the at least one TDM, the combination of FDM or for the first pilot the receiver characterized in that the decision by the CDM with the determined positions of time and frequency. 상기 제2 파일럿은 상기 미리 정의된 TTI에서 시간 및 주파수 안에서 산란된 패턴을 가지고 맵핑되는 복수의 심볼로 구성되는 것을 특징으로 하는 수신기. Wherein the second pilot is a receiver, characterized in that consisting of a plurality of symbols mapped with a scattered pattern in the time and frequency in the pre-defined TTI.